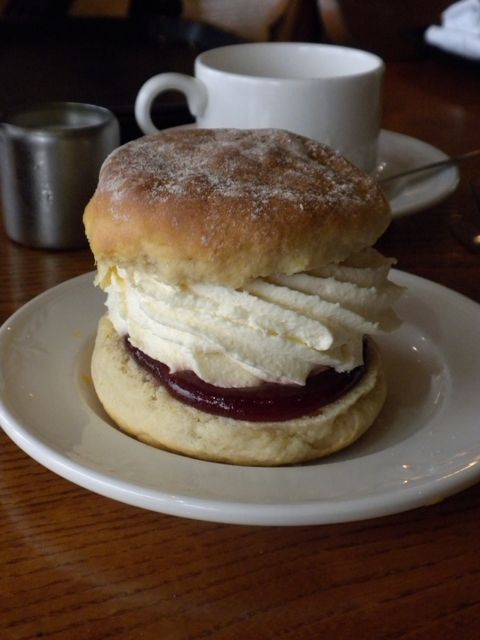 I've been home from England and Scotland for awhile and I've been trying to recreate this wonderful scone that I enjoyed so much in Oban, Scotland. This scone was so fabulous I can't even describe the taste. But, this photo tells the story. On Saturday morning the ACW Anglican Church Women at my church had their first business meeting for the new business year. I decided to practice my skills at scone making and I brought baked scones, butter, strawberry jam and whipped cream to the monthly meeting. I also brought six tea pots, creamers, sugar bowls, milk and sugar from home. While the meeting was being held the ladies enjoyed a scone and a cup of tea in their own tea cups. Some even enjoyed tea - British style with milk and sugar added. I have been busy the last few weeks with Tea Parties. First I catered the food for my dear friend. Friendship Tea Here And Saturday morning I took my scones and tea to church. I started to put the tea things in tubs on Thursday. On Friday morning I made made four batches of scones. The total time to make the dough and bake the batches was three hours. When I was finished baking the first dozen I lined a glass 9 inch x 13 inch glass baking dish with clear plastic wrap and layered the scones in the dish wrapping each dozen separately. I was so amazed on Saturday morning when I opened the plastic wrap the scones were just as fresh as when I took them out of the oven on Friday. And while I was in London I bought this British Tea Towel and lined the bread basket with it. Just a touch of England. I bought a British flag and a Scottish flag to remind me of my wonderful experiences in the two most amazing countries in the world. Just my opinion! Closer look at my packing job. Yum! The scones were so moist I didn't have to reheat them. I just unwrapped the top layer and we were good to go! The tubs are ready to go. I did have a laundry basket and I added my instant tea pot, hand mixer and some of my sunflowers for the table in the tub with my own cute tea cup. Before I was able to take any photos. The ladies had already started to make their scones. My sister-in-law's recipe via my niece who lived in England for several years. Combine dry ingredients. With fingers cut in the butter until dough is crumbly. Add Milk and mix with fork until moist. Roll out dough onto floured surface to about 1inches- 2 inches thick. Cut desired shape. Roll edges in sugar. Bake on greased baking sheet for 14-16 minutes. This is the table at church. My red and white table cloth with sunflowers in the french bucket. When 'The Three Ladies Go Traveling' were on one of our walking tours in London. We visited 'Twinings' Tea Store. Oh what a joy... Every morning while traveling I would have a cup of English Breakfast tea and I loved drinking the tea so much I brought a box home. I thought it would be the perfect flavor to have with our scones and I was right. 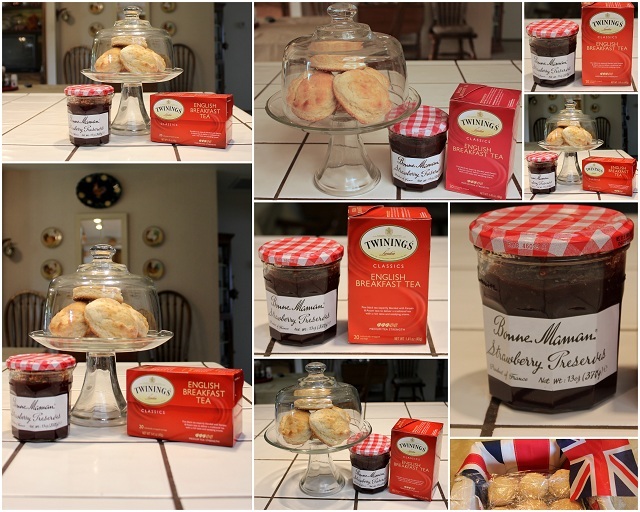 Our tea was over at noon and packed up my goodies and along with me came the remaining scones, strawberry preserves,butter, whipped cream and tea. Yep!!! My Sweetheart and I had Scones and Tea at Three. Thank you for visiting me today. I hope you have enjoyed my scone story. Thank you to my newest follower. I will be joining some great friends for some awesome parties. Your English tea looks delightful. There is usually a question mark over whether you have the cream on the bottom and the jam on top, I see you did it the way I do, jam at the bottom and then as much cream as possible ;-)) In the UK we would serve scones with clotted cream but possibly it isn't available? Thank you for sharing an English custom that I love, we often have a cream tea wherever we are in GB. That scone looks delicious! I love Twinnings English Breakfast tea. I have a cup or two each morning. All that looks delicious. That one scone is just looking super.Wow , I get hungry. What a lovely tea for your friends. I really enjoyed your post. Thank you for sharing and have a wonderful week. Wow that is yummy right there. I love your blog-home...and your autumn wreath is divine! Hello Betty, I'm visiting from Rose Chintz Cottage. Your scone story is inspiring, how kind of you to treat the ACW to an English tea. When I look at the first photo, I think I must make my scones way too small! I'm also wondering about the butter vs shortening aspect, I use Crisco in my scones, would they taste better with butter? I also came over Sandi's Rose Chintz Cottage. The scones llok fantastic. You did a fabulous job. Your friend was surely very happy with that kind of catering. Thank you so much for sharing. I love your scone story and I love the British Isles. Canada always had the Union Jack as their flag until the '60's and then we got our own flag. I've always loved the UJ. Pretty teacup! Thanks for sharing the recipe for your scones. they look fabulous! A very pretty and tasty post. Yours scones look delicious. I'm coming over, please save one for me! Tea and scones ... delightful! You are making my mouth water! Love your teacup. Happy Tea Day! Enjoyed your lovely posting today! We had hoped to visit Oban on our last trip to Scotland, but didn't get there, We stayed with family in Kintyre. I love the Union Jack tea towel! what a great post! fantastic scones and the cup is amazing. I am so glad you shared this! It sounds as if you created a wonderful experience for the ladies and again later for yourself and your husband. We enjoy our afternoon tea, though we are refraining from scones until later notice. Yours look heavenly!